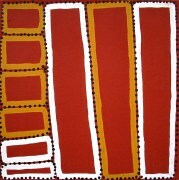 Walala Tjapaltjarri was born in the early 1960s at Marua to the east of Kiwirrkurra in the Gibson Desert. 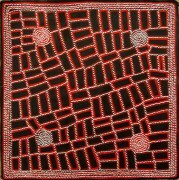 In late 1984, Walala and eight other relatives of the Pintupi Tribe walked out of the desert in Western Australia and made contact for the first time with European society. The group had been following their traditional lifestyle in the country west of Lake Mackay, until forced out of the desert by severe drought. Described as \'The Lost Tribe\', he and his family created international headlines. 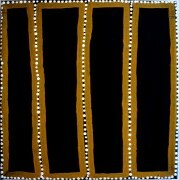 Walal paints the Tingari Cycle associated with his sacred sites – including Wilkinkarra, Maruwa, Tarrku, Njami and Yarrawangu, which are important rockholes, sandhills, sacred mountains and water soakages within the Gibson Desert.